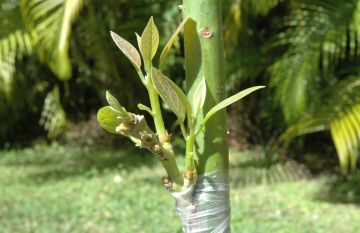 Listing of all the avocado trees I have in Homestead, Florida. Also I will list information on propagation methods. We are building a data base of information, specially on varieties that there is little information on, like Florida Hass Avocado, my most visited page. if you have something to contribute, please do. Use the contact form on this web. I do not send regular email , spam etc. but I will reply. This web page started as a location to keep my own research, pictures, notes etc. Keep this in mind when you view these pages. Then, why not open it for all interested persons to see. Seems to have been a good idea, over 350 people visit these pages a day. In this web pages I plan to build a page for every cultivar that I own showing pictures, available information and my own observations. At the present time I'm working with 45 + avocado cultivars from different parts, observing and documenting how they behave in South Florida. Also I would like it to be a place where interested persons can find information on grafting techniques and general propagation information. If you have something to contribute by way of personal experience on any of the listed varieties or pictures please send them to me. My special interest is in early and very late fruit. We are building a data base of information, specially on varieties that there is little information on, like Florida Hass Avocado, my most visited page. if you have something to contribute, please do. Use the contact form on this web. I do not send regular email but I will reply. Visit my YouTube Channel for interesting grafting videos, product reviews and more. Check my Blog when I get a question I post the question and my reply in the blog. Check my new section "new varieties" If you have planted an avocado seed and the tree is bearing fruit. If you think that fruit is worth talking about it, let me know. I believe there are a lot of new varieties waiting to be discovered in people's yards. I will not publish your information and will post information with the limitations you require. I get a lot of mail from people asking questions about what variety to plant. There is an avocado special ops person that likes to grow outside of temperature boundaries, that is a hobby to some. To most, the best way to find out is to ask around or join forums like http://tropicalfruitforum.com/ and http://cloudforest.com/cafe/ were you can ask very nice people in the area what works for them. Same about bud wood, ask around to see who has what you need and is willing to share. You will be surprise how nice plant people are.